Performers include: Steve Allen, Gene Rayburn, Skitch Henderson, Les Brown, Don Knotts, Tom Poston, Louis Nye, Pat Harrington Jr., Bill Dana, Joey Forman, Buck Henry, The Smothers Brothers, Tim Conway, and Jayne Meadows. 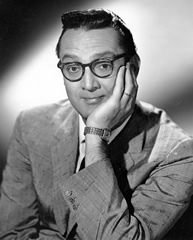 A predecessor to many of the popular late-night talk shows of today, this daring series is hosted by comedian Steve Allen. Episodes are regularly filled with comedy skits (often extending to locales outside the studio), wild stunts, musical performances and interviews with celebrities and interesting eccentrics. The show’s announcer is Gene Rayburn and the show’s band is Les Brown and His Band of Renown. Regular sketch players include Tom Poston, Don Knotts, Audrey Meadows, and Tim Conway.